To get the most out of the new underground rail line and the relief it will provide to crowding, we will be building a new passenger platform and additional track at West Footscray station to enable trains to start and finish services at West Footscray. The new passenger platform will be located on the northern side of West Footscray station (Cross Street side) and will service city-bound trains coming from Sunbury in the peak periods. The existing city-bound platform will be used for trains to start and finish services at West Footscray station. 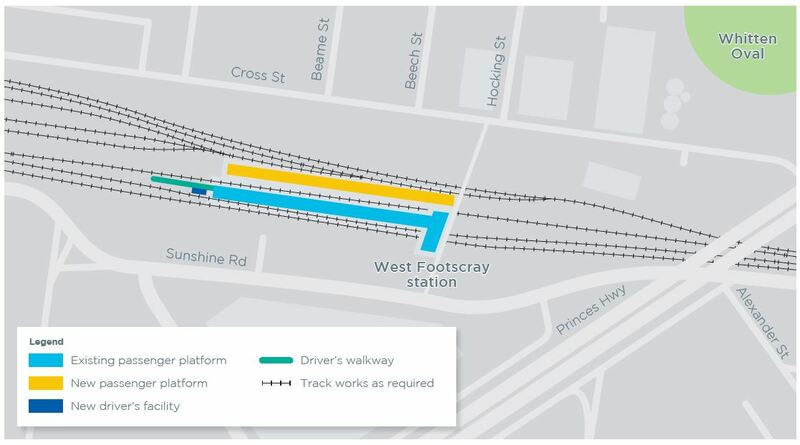 The works at West Footscray will involve realigning regional, suburban and freight tracks, construction of new tracks and turnbacks (to enable trains to change direction), a new third passenger platform and alterations to the existing station concourse. Construction of the new platform and track will be carefully planned to limit disruption to commuters and the local community. Construction works may create noise, dust and vibration typical of a construction site for the duration of the works. With construction taking place in the rail corridor, there will be some unavoidable disruption to rail services so these works can be undertaken safely. Bus replacement services will be provided during these planned disruptions. There will be temporary impacts to station car parking on the Cross Street side of the station during construction. As part of the planning process for these works, RIA will prepare two draft Development Plans for public display and comment. The draft Western Turnback Development Plan – Stage 1 (Rail Works) was on display in December 2018. The Development Plans will set out the scope and extent of the built form and urban design around the Metro Tunnel Project’s works at West Footscray station. Development Plans was available for public viewing and comment for 15 business days, prior to submission to the Minister for Planning for approval. Major construction works at West Footscray station will begin in early 2019 (pending approval), with associated track work to be completed in time for the Metro Tunnel’s first day of operation in 2025. Development Plan Stage 1 (rail works, including track and utilities) available for public viewing and comment.